BoneView is launching their new Bone Zone Mini O3 Scent Eliminator on their website and Amazon. The Bone Zone Mini is a portable, battery powered ozone generator designed to completely eliminate odors in your hunting pack or gear bag. You could also use a small tote to eliminate odors on your boots and other small items while in storage. The Bone Zone Mini O3 is effective in eliminating all odors in one to five cubic feet of closed space. Using ozone to eliminate odors is not a new concept. It has been used in industrial and medical applications for years. It can effectively sanitize and destroy odor causing molecules produced by sweat, bacteria, oils, smoke, and more. Ozonics is credited with introducing ozone technology to the hunting market. The HR-300 Scent Elimination System is their newest and most effective ozone generator. Ozonics has done a tremendous job educating hunters about the benefits and effectiveness of ozone for eliminating odor. Other hunting industry manufacturers, including Scent Crusher, Scentlok, and BoneView, have followed the Ozonics lead. Now there is a wide variety of products available for hunters concerned with odor control. The BoneView Mini O3 Scent Eliminator is powered by a lightweight lithium ion battery. Charging is simple, utilizing a micro-usb port and the included charger. The charge will last 3-6 hours of use, which is more than enough time to deodorize your gear multiple times. 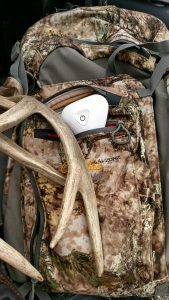 The Bone Zone Mini O3 can be used in a backpack the night before, during your hunt, or while walking to the stand. It is useful for multi-day hunting trips, where washing clothing is not an option. BoneView has also designed a larger sized high output model, but it is not yet available. 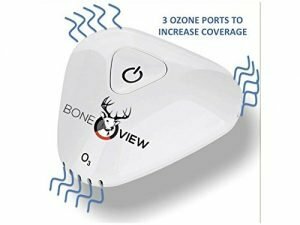 The suggested retail price on the Bone Zone Mini O3 is $39.95. However, it sells for only $29.95, making it the most affordable ozone generator designed for the hunting market. It is currently sold on the BoneView website and Amazon. Free shipping is frequently available from Amazon, making it the preferred place to buy. In addition, there may also be discounts and purchase specials available, making this technology even more affordable. The importance placed on scent elimination, and the low cost of the Mini O3, will create high demand. Supply issues resulting in back-orders are likely. Don’t hesitate to take advantage of the current offers if you are interested in trying the BoneView Scent Eliminator. If you would like updates with the best online deals for hunting equipment and apparel join the Hunting Gear Deals email list. I’ll also let you know when there are new blog posts. Visit the Home Page for links to all the latest deals on hunting gear and apparel!